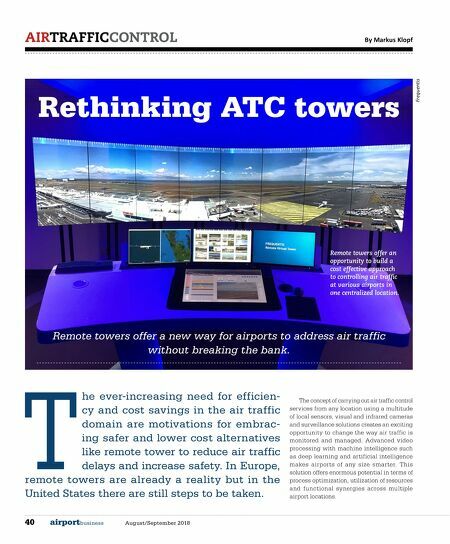 40 airportbusiness August/September 2018 AIR TRAFFIC CONTROL By Markus Klopf Rethinking ATC towers Remote towers offer a new way for airports to address air traffic without breaking the bank. Remote towers offer an opportunity to build a cost effective approach to controlling air traffic at various airports in one centralized location. 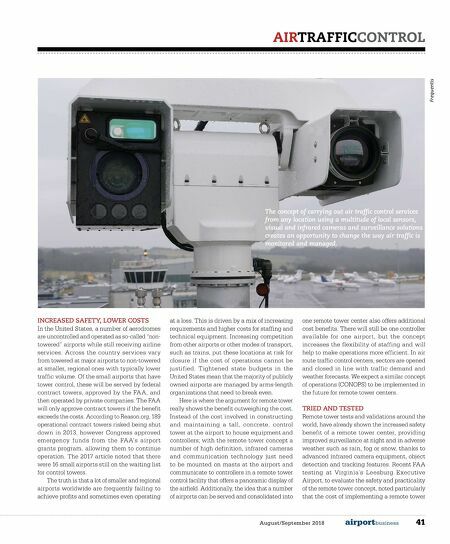 Frequentis The ever-increasing need for efficiency and cost savings in the air traffic domain are motivations for embracing safer and lower cost alternatives like remote tower to reduce air traffic delays and increase safety. In Europe, remote towers are already a reality but in the United States there are still steps to be taken. The concept of carrying out air traffic control services from any location using a multitude of local sensors, visual and infrared cameras and surveillance solutions creates an exciting opportunity to change the way air traffic is monitored and managed. Advanced video processing with machine intelligence such as deep learning and artificial intelligence makes airports of any size smarter. This solution offers enormous potential in terms of process optimization, utilization of resources and functional synergies across multiple airport locations.